President Trump said he may let his March 2 deadline for reaching a trade agreement with China “slide for a little while” if the two countries are near a deal by then. Was Theresa May’s Brexit endgame overheard in a bar? The British prime minister reportedly plans to leave a parliamentary vote on her Brexit deal to the last moment, then force politicians to pick between it or a long delay for Britain’s exit from the E.U. Mrs. May previously opposed a delay. She has insisted that lawmakers have a choice between her deal or no deal. “An option to extend for a longer period would just continue the uncertainty,” she told business leaders in a conference call yesterday. The comments could spell trouble for her. They may undermine her efforts to muster enough support in Parliament for her deal. Mrs. May’s office had no comment on the remarks attributed to Mr. Robbins. 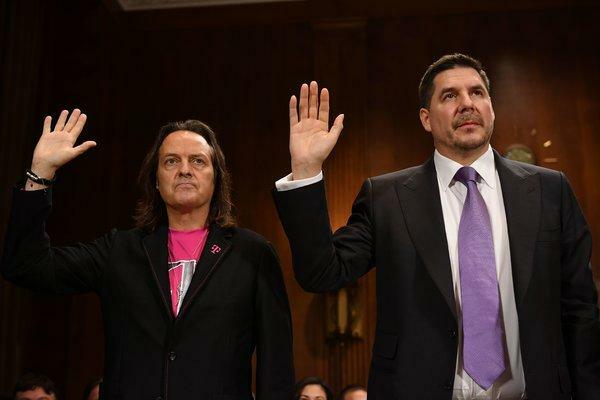 The carriers’ C.E.O.s are scheduled to appear on Capitol Hill this week to defend T-Mobile’s proposed $26 billion acquisition of Sprint. Their first stop is the House Committee on Energy and Commerce today, where they’ll face Democrats who are increasingly skeptical about letting the nation’s third- and fourth-biggest carriers combine. What to expect: John Legere of T-Mobile will repeat his claim that merging the two companies would create a stronger rival to Verizon and AT&T. “I want to reiterate unequivocally that prices will go down and customers will get more for less,” he told Bloomberg in an interview. And he’ll emphasize the combined company’s ability to roll out 5G wireless service, playing off fears that the U.S. may fall behind China in that area. But lawmakers have issues with the deal. Democrats think a merger would actually increase prices for consumers, as well as bring job cuts. Some lawmakers also contend that promises to increase rural wireless broadband are empty. And some critics say that dozens of stays by Mr. Legere at President Trump’s Washington hotel since the deal was announced may have been improper. A political caveat: Though Democratic opposition to the deal appears to be growing — nine senators called for the deal to be blocked — Congress doesn’t get a say. It can only apply pressure to the Justice Department and the F.C.C. to block it. Still, the telecoms aren’t resting easy. Bloomberg notes that the spread between T-Mobile’s offer price and Sprint’s stock price has grown since December, suggesting that investors think the deal’s chances of winning approval are getting worse. The Trump administration is moving closer to barring telecom companies in the U.S. from using Chinese equipment while building next-generation wireless networks, Julian E. Barnes of the NYT writes. The former Nissan chairman, who’s still detained in Japan, has replaced his legal team — perhaps in a bid to try a more aggressive strategy. Who’s out: Motonari Otsuru, a former prosecutor familiar with the tactics employed in Japanese courtrooms. Who’s in: Junichiro Hironaka, whose nickname in Japan is “the innocence contractor.” He has successfully defended government officials against corruption charges and a prominent businessman against accusations of insider dealing. More Nissan news: The French government reportedly pressed the Japanese carmaker about merging with its corporate sibling, Renault, but was rebuffed. And the company reported a 45 percent drop in third-quarter earnings yesterday. The Chronicle of Philanthropy’s list of the 50 most generous donors to charitable causes shows that they jointly gave $7.8 billion in 2018. That’s impressive — until you compare it to 2017, when donors gave $14.7 billion. Topping the list were Jeff and MacKenzie Bezos, who gave $2 billion. Michael Bloomberg was a distant second, having given $767 million. Other notable donors included Blackstone’s Steve Schwarzman, Mark and Priscilla Zuckerberg, and Bill and Melinda Gates. The drop-off in giving was stark. Theodore Schleifer of Recode points out that the Gates Foundation gave $150 million last year, compared with $4.8 billion in 2017. The Zuckerbergs donated $200 million last year, down from $2 billion in 2017. Some of America’s largest news publishers are unhappy with the financial terms of a news subscription service that Apple plans to unveil later this year, according to the WSJ, citing unnamed sources. • BuzzFeed reports, citing anonymous sources, that it is expected to be unveiled on March 25. • But “in its pitch to some news organizations, the Cupertino, Calif., company has said it would keep about half of the subscription revenue from the service,” according to the WSJ. At the party: Gary Cohn, the former Trump economic adviser and Goldman Sachs president; John Flannery, who was ousted as G.E.’s chief executive last fall; and Douglas Haynes, who resigned as president of Mr. Cohen’s Point72 hedge fund. Saudi Arabia’s sovereign wealth fund, the Public Investment Fund, is opening an office in San Francisco to help strike more tech deals.